Today I wanted to share a simple tip that is utilized by many hikers when they’re out on the trail. That tip is to wear two pairs of socks while hiking. Socks are a really important part of your hiking gear so it’s worth spending some time trying to get the right set-up for you. These of course aren’t any old socks and so of course first and foremost, you need hiking specific socks. There are any number of brands out there and I will do a post soon to review what to look for when buying hiking socks as well as what’s on offer. However, in the meantime if you’re not sure of a good brand and need to get some hiking socks soon, I’ll give links to what I use below. Why Two Pairs of Socks? Briefly, I’ll explain why it’s advantageous to wear two pairs of socks while hiking but before doing that, it is worth pointing out the characteristics of each pair first. This sock is the thinner and tighter of the two and sits against your skin. The purpose of this sock is that it remains more or less static against your skin and so prevents friction which, of course, leads eventually to blisters which as we definitely don’t want! This sock is, perhaps it could be called, the main sock. This one is put on over the inner liner sock. This sock is much thicker and it’s main purpose is to keep your foot comfortable and warm. It will have other functional capabilities too e.g. moisture wicking. 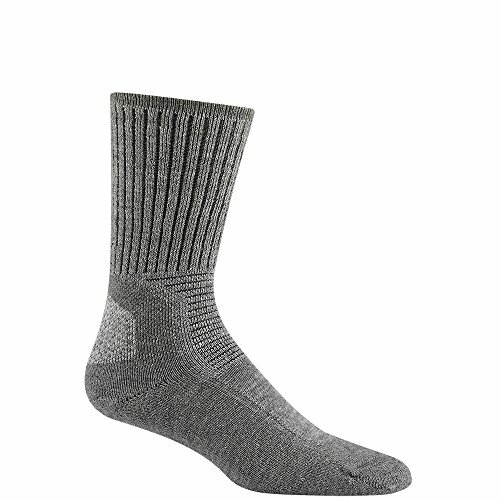 Note, depending on your hiking needs, the outer socks come in different thickness levels. As already alluded to, the main reason for the two sock strategy is to ensure your feet can move comfortably without generating friction on your skin which will lead to blisters. The inner sock sits snug and tight on your feet providing some room for movement on the outer sock. All of this should lead to having as comfortable a pair feet as possible while hiking on the trail! Today’s short post was about a simple process that will help keep your feet as comfortable as possible out on the trail while helping to prevent foot blisters at the same time. It’s easy to do and will save you a lot of hassle, especially on longer hikes when you’re pushing things that bit harder! Finally, I said I’d recommend what I use when I go hiking. For hiking socks, I have been using Wig Wam Hiking Socks (see picture above) since my Mont Blanc trip and I have been very pleased with them. I use a separate inner liner sock and outer hiking sock, I mention that as you can get the two built into one. I have used the all-in-one type sock and found them to be good too. However, for the Alps, I needed something much warmer than what I had so made the switch to Wig Wam. I can’t stress enough how important your hiking socks are, I’ve mentioned this before several times here on the site but I think they’re as important as you’re hiking boots! Finally, it’s worth stating that two socks may not always be appropriate. For example, if you’re hiking in very hot temperatures, there may be very good reasons to try and get by with just one lighter pair. What hiking socks do you recommend? I’d love to hear your suggestions in the comments below. How To Choose Hiking Socks Never Wear Cotton Clothes Hiking! Using Vaseline To Prevent Foot Blisters How To Prevent And Treat Foot Blisters On The Trail Hiking Socks – Very Important Part Of Your Hiking Gear!